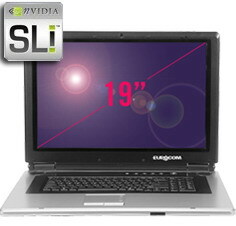 Eurocom Corporation, a leader in the Desktop Replacement notebook technology since 1989, is launching a perfect fully upgradeable Mobile Workstation Supernotebook featuring 19-inch display, 64-bit AMD Turion64 and Nvidia's revolutionary Video Technology with Nvidia GeForce Go7800GTX or ATi Mobility Radeon x800XT Platinum Edition each equipped with 256MB of superfast DDR3 VRAM. Having successfully incorporated the upgradeable graphics and dual-core processors into its portable systems, Eurocom continues to deliver the cutting-edge notebook technologies by moving into larger displays. The new EUROCOM M590K Emperor model comes with a 19-inch WSXGA+ TFT LCD screen with native 1680 x 1050 resolution. The 290-nits brightness ensures that even in direct sunlight you can see the display clearly. Coupled with a choice of upgradeable graphics such as: NVIDIA's VGA technology with 256MB DDR3 Nvidia GeForce Go7800GTX or 256MB DDR3 ATi Mobility Radeon x800XT Platinum Edition, and SRS WOW Surround Sound System, the M590K EMPEROR is a perfect high-end engineering professional computing solution wonderfully suited for those doing 3D Animation and Modelling, 3D Simulation, publishing and graphics work as well as mobile gaming. EUROCOM M590K offers up to 2 GB of DDR400 RAM and up to 120GB 7,200rpm SATA-2 hard drive, 8x Multi DVD Burner and 4-in-1 media card reader. Noteworthy is the AMD Mobile Turion64 (35W) MT-37/40 processor with 1MB L2 cache and the ensemble of a optional internal TV Tuner, 802.11a/b/g wireless LAN, Bluetooth, 10/1000 Ethernet, five USB 2.0 ports, FireWire, HDTV port, DVI-I port for dual display, and all standard ports. Being a true mobile workstation, the M590K Emperor is designed to be physically larger than typical travelling mate notebooks and comes equipped with a desktop-like full-size 102-key keyboard with a separate numeric keypad for ease of typing and integrated WebCam for video conferencing. The system measures 476 x 343 x 29.5mm and weights 6.5 kg. Eurocom offers 1 year standard warranty and optional 3 years Return to Factory and On-Site warranty. The system is scheduled to be shipped in February 2006.